Both Democratic presidential candidates’ campaigns will be holding rallies in San Diego this weekend, gearing up for the June 7th primary election. Vermont Senator Bernie Sanders will hold rallies in the South Bay and North C ounty, while former President Bill Clinton will hold a rally in Chula Vista and a fundraiser in Rancho Santa Fe for his wife, Hillary Clinton. 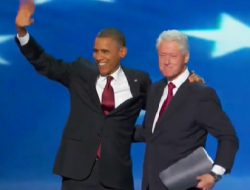 A nominating speech by former President Bill Clinton laid out arguments for reelecting Obama. Since 1991, Republicans have held the White House for 28 years, Democrats 24 years, yet Democrats have provided more jobs, he noted.